Jonathan English is a musician and songwriter who has been playing guitar for 20 years. The son of Australian music icon Jon English, Jonathan learned his first chords on his dad’s well-worn black Yamaha APX at the age of 12. He spent his teenage years juggling school with working part-time in his father’s band, touring the country in the ‘Turn The Page’ national tours of 1996-2000. In 2000 he played bass & guitar in the original production of Jon’s musical ‘Buskers & Angels’; and for the next six years continued touring on & off with his dad’s band. 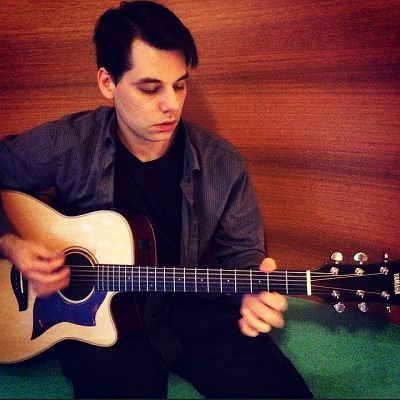 Throughout the early 2000’s Jonathan also wrote songs and performed with several bands in Sydney’s alternative scene, recording and producing four EP’s in that time. He continues to collaborate with his father in Jon’s many live incarnations both in Australia and overseas. March 2005 saw father and son performed for the UN in East Timor for the ‘Tour de Force’. He played lead guitar in the orchestra for his father’s Aria-winning rock opera ‘Paris’ in the Southern Cross Musicals outstanding 2008 production. In 2010 he recorded and wrote arrangements for the NRL Parramatta Eel’s theme song alongside Jon and producer Michael Carpenter. Jonathan joined his dad on stage again in Sweden in June 2013 for Jon’s much-anticipated return tour of the country. In 2009, Jonathan joined the inaugural production of the Rock Show trilogy, three critically acclaimed stage shows that toured national theatres for the next four years and won back-to-back Mo Awards for “Best Rock Act” in 2012 & 2013. As well as playing guitar, bass & keys in the show, Jonathan became a co-writer and co-director of ‘Rock Show More’ & ‘Rock Revolution’. Most recently Jonathan has been working as a guitarist for up-&-coming Australian country star Christie Lamb. In 2013 he co-wrote four songs off Christie’s debut album ‘All She Wrote’, including the single ‘Manhunt’ which went to no. 8 on the national charts. They are currently embarked on a national tour for the album including shows at the Gympie & Deni ‘Music Musters’ as well as Tamworth Festival in January 2015.